Last Thursday, Nobel Laureate Sam Ting presented the latest results (CERN press release) from the Alpha Magnetic Spectrometer (AMS-02) experiment, a particle detector attached to the International Space Station—think “ATLAS/CMS in space.” Instead of beams of protons, the AMS detector examines cosmic rays in search of signatures of new physics such as the products of dark matter annihilation in our galaxy. Image of AMS-02 on the space station, from NASA. In fact, this is just the latest chapter in an ongoing mystery involving the energy spectrum of cosmic positrons. Recall that positrons are the antimatter versions of electrons with identical properties except having opposite charge. They’re produced from known astrophysical processes when high-energy cosmic rays (mostly protons) crash into interstellar gas—in this case they’re known as `secondaries’ because they’re a product of the `primary’ cosmic rays. 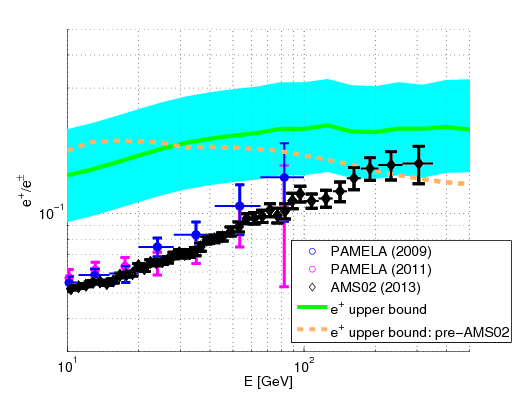 Observed positron fraction from recent experiments compared to expected astrophysical background (gray) from APS viewpoint article based on the 2013 AMS-02 results (data) and the analysis in 1002.1910 (background). The observation of a maximum in what was otherwise a fairly featureless rising curve is key for interpretations of the excess, as we discuss below. A second observation is a bit more curious: while neither the electron nor the positron spectra follow a simple power law, , the total electron or positron flux does follow such a power law over a range of energies. Total electron/positron flux weighted by the cubed energy and the fit to a simple power law. From the AMS press summary. This is a little harder to interpret since the flux form electrons also, in principle, includes different sources of background. Note that this plot reaches higher energies than the positron fraction—part of the reason for this is that it is more difficult to distinguish between electrons and positrons at high energies. This is because the identification depends on how the particle bends in the AMS magnetic field and higher energy particles bend less. This, incidentally, is also why the FERMI data has much larger error bars in the first plot above—FERMI doesn’t have its own magnetic field and must rely on that of the Earth for charge discrimination. So what should one make of the latest results? The most optimistic hope is that this is a signal of dark matter, and at this point this is more of a ‘wish’ than a deduction. Independently of AMS, we know is that dark matter exists in a halo that surrounds our galaxy. The simplest dark matter models also assume that when two dark matter particles find each other in this halo, they can annihilate into Standard Model particle–anti-particle pairs, such as electrons and positrons—the latter potentially yielding the rising positron fraction signal seen by AMS. From a particle physics perspective, this would be the most exciting possibility. The ‘smoking gun’ signature of such a scenario would be a steep drop in the positron fraction at the mass of the dark matter particle. This is because the annihilation occurs at low velocities so that the energy of the annihilation products is set by the dark matter mass. This is why the observation of a maximum in the positron fraction is interesting: the dark matter interpretation of this excess hinges on how steeply the fraction drops off. There are, however, reasons to be skeptical. One attractive feature of dark matter annihilations is thermal freeze out: the observation that the annihilation rate determines how much dark matter exists today after being in thermal equilibrium in the early universe. The AMS excess is suggestive of heavy (~TeV scale) dark matter with an annihilation rate three orders of magnitude larger than the rate required for thermal freeze out. 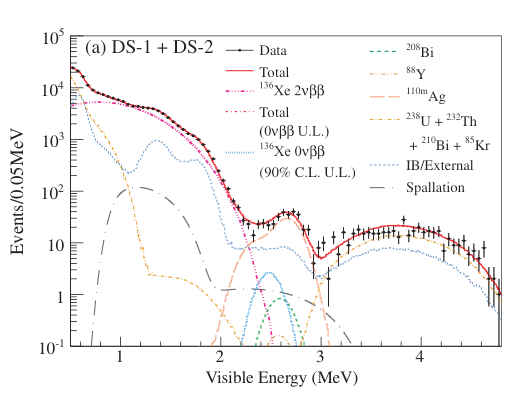 A study of the types of spectra one expects from dark matter annihilation shows fits that are somewhat in conflict with the combined observations of the positron fraction, total electron/positron flux, and the anti-proton flux (see 0809.2409). 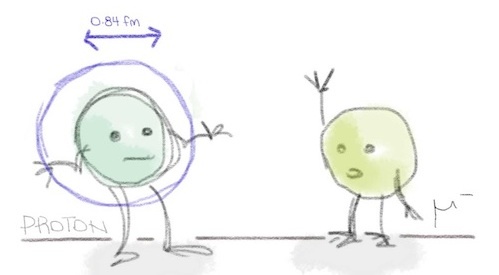 The anti-proton flux, in particular, does not have any known excess that would otherwise be predicted by dark matter annihilation into quarks. Pulsars are neutron stars that are known to emit “primary” electron/positron pairs. A nearby pulsar may be responsible for the observed rising positron fraction. See 1304.1791 for a recent discussion. Alternately, supernova remnants may also generate a “secondary” spectrum of positrons from acceleration along shock waves (0909.4060, 0903.2794, 1402.0855). Both of these scenarios are plausible and should temper the optimism that the rising positron fraction represents a measurement of dark matter. One useful handle to disfavor the astrophysical interpretations is to note that they would be anisotropic (not constant over all directions) whereas the dark matter signal would be isotropic. See 1405.4884 for a recent discussion. At the moment, the AMS measurements do not measure any anisotropy but are not yet sensitive enough to rule out astrophysical interpretations. Upper bound on secondary positron fraction from 1305.1324. See Resonaances for an updated plot with last week’s data. We see that the AMS-02 spectrum is just under the authors’ upper bound, and that the reported downturn is consistent with (even predicted from) the upper-bound. 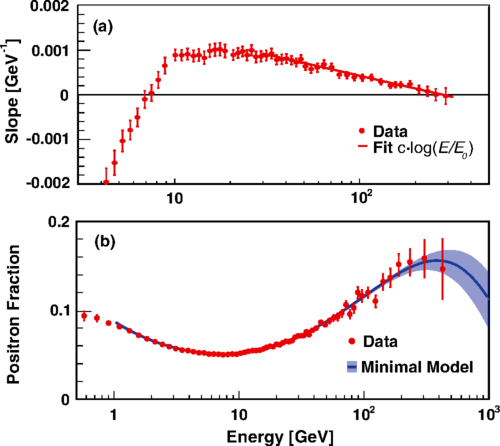 The authors’ analysis then suggests a non-dark matter explanation for the positron excess. See this post from Resonaances for a discussion of this point and an updated version of the above plot from the authors. A corresponding upturn in the anti-proton flux is predicted in many types of dark matter annihilation models for the rising positron fraction. 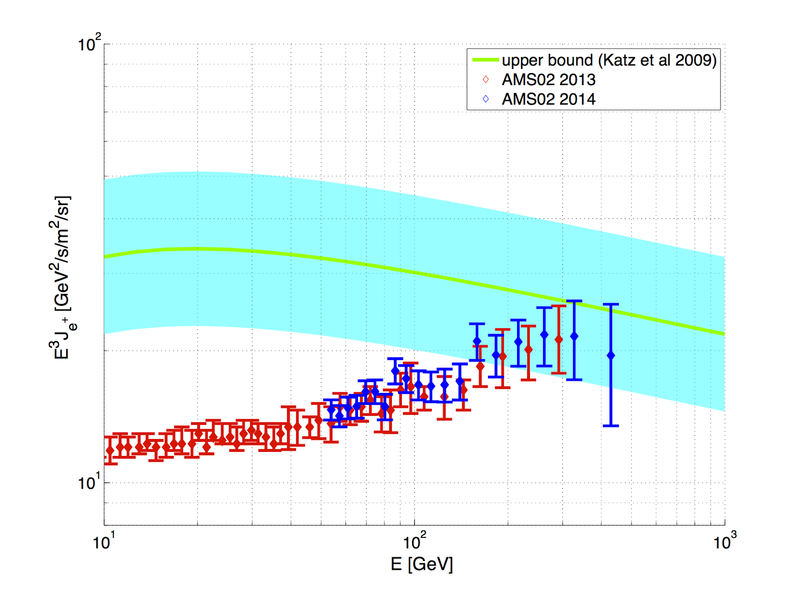 Thus far AMS-02 has not released anti-proton data due to the lower numbers of anti-protons. Further sensitivity to the (an)isotropy of the excess is a critical test of the dark matter interpretation. The shape of the drop-off with energy is also critical: a gradual drop-off is unlikely to come from dark matter whereas a steep drop off is considered to be a smoking gun for dark matter. Only time will tell; though Ting suggested that new results would be presented at the upcoming AMS meeting at CERN in 2 months. 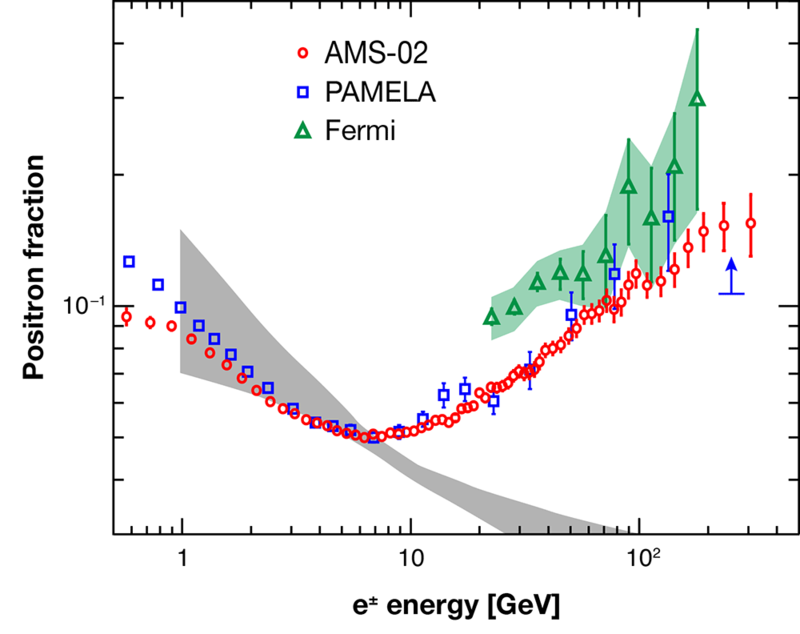 The recent Sackler Symposium on the Nature of Dark matter included three talks on various aspects of the Pamela/FERMI/AMS-02 rising positron fraction. You can view the videos here: Linden (pulsars), Galli (dark matter), Blum (upper bound on secondaries). In addition to the latest post at Resonaances, see earlier posts from last year’s AMS results at Resonaances and Of Particular Significance. The APS Physics journal has a nice synopsis article on this year’s AMS-02 results; see also their more extensive viewpoint article from last year’s results. For a more hands-on introduction to indirect detection of dark matter, see Stefano Profumo’s 2012 TASI lectures with particular attention to lecture 3. This post was edited by Christine Muccianti. Neutrinoless double beta decay is a theorized process that, if observed, would provide evidence that the neutrino is its own antiparticle. The relatively recent discovery of neutrino mass from oscillation experiments makes this search particularly relevant, since the Majorana mechanism that requires particles to be self-conjugate can also provide mass. A variety of experiments based on different techniques hope to observe this process. Before providing an experimental overview, we first discuss the theory itself. Figure 1: Neutrinoless double beta decay. Beta decay occurs when an electron or positron is released along with a corresponding neutrino. Double beta decay is simply the simultaneous beta decay of two neutrons in a nucleus. “Neutrinoless,” of course, means that this decay occurs without the accompanying neutrinos; in this case, the two neutrinos in the beta decay annihilate with one another, which is only possible if they are self-conjugate. Figures 1 and 2 demonstrate the process by formula and image, respectively. Figure 2: Double beta decay & neutrinoless double beta decay, from particlecentral.com/neutrinos_page.html. The lack of accompanying neutrinos in such a decay violates lepton number, meaning this process is forbidden unless neutrinos are Majorana fermions. Without delving into a full explanation, this simply means that a particle is its own antiparticle (though more information is given in the references.) The importance lies in the lepton number of a neutrino. 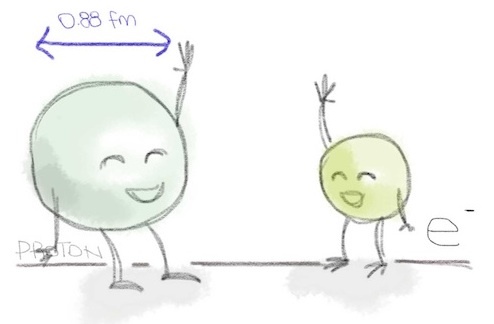 Neutrinoless double beta decay would require a nucleus to absorb two neutrinos, then decay into two protons and two electrons (to conserve charge). The only way in which this process does not violate lepton number is if the lepton charge is the same for a neutrino and an antineutrino; in other words, if they are the same particle. The experiments currently searching for neutrinoless double beta decay can be classified according to the material used for detection. A partial list of active and future experiments is provided below. 1. EXO (Enriched Xenon Observatory): New Mexico, USA. The detector is filled with liquid 136Xe, which provides worse energy resolution than gaseous xenon, but is compensated by the use of both scintillating and ionizing signals. The collaboration finds no statistically significant evidence for 0νββ decay, and place a lower limit on the half life of 1.1 * 1025 years at 90% confidence. 2. KamLAND-Zen: Kamioka underground neutrino observatory near Toyama, Japan. Like EXO, the experiment uses liquid xenon, but in the past has required purification due to aluminum contaminations in the detector. They report a 0νββ half life 90% CL at 2.6 * 1025 years. Figure 3 shows the energy spectra of candidate events with the best fit background. Figure 2: KamLAND-Zen energy spectra of selected candidate events together with the best-fit backgrounds and 2νββ decays. 3. GERDA (Germanium Dectetor Array): Laboratori Nazionali del Gran Sasso, Italy. GERDA utilizes High Purity 76Ge diodes, which provide excellent energy resolution but typically have very large backgrounds. To prevent signal contamination, GERDA has ultra-pure shielding that protect measurements from environmental radiation background sources. The half life is bound below at 90% confidence by 2.1 * 1025 years. 4. MAJORANA: South Dakota, USA. This experiment is under construction, but a prototpye is expected to begin running in 2014. If results from GERDA and MAJORANA look good, there is talk of building a next generation germanium experiment that combines diodes from each detector. 5. CUORE: Laboratori Nazionali del Gran Sasso, Italy. CUORE is a 130Te bolometric direct detector, meaning that it has two layers: an absorber made of crystal that releases energy when struck, and a sensor which detects the induced temperature changes. The experiment is currently under construction, so there are no definite results, but it expects to begin taking data in 2015. While these results do not seem to show the existence of 0νββ decay, such an observation would demonstrate the existence of Majorana fermions and give an estimate of the absolute neutrino mass scale. However, a missing observation would be just as significant in the role of scientific discovery, since this would imply that the neutrino is not in fact its own antiparticle. To get a better limit on the half life, more advanced detector technologies are necessary; it will be interesting to see if MAJORANA and CUORE will have better sensitivity to this process.